For most spinning above 4000 of most brands(With accessores supplied), Like Penn Shimano Daiwa Avet Accurate Okuma Pflueger Zeebass Van Staal Finnor. 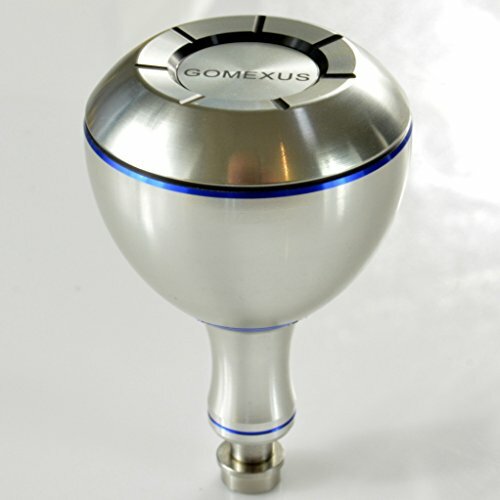 3,Fasten Gomexus Knob to your handle, with the screw supplied. —Reminder, the shaft-insert-length to reel handle is 4.5mm,in case yours is far more than 4.5mm at this direction, you need to cut some to adjust it. 1,If not sure about the compatibility to your reels, just contact us, we have data base of reels more than 1,000 models, it might help-out. 2,We have knobs with direct fitment and drill fitment ranging from 30mm to 50mm, contact us to find it out for your reelsDIRECT FITMENT:Direct For 08 Stella SW,Twinpower SW,Spheros SW,Biomaster SW 6000PG 8000PG, Stradic FK 5000 FJ 6000 8000, Saltiga Z 4000-6500, Catalina 4500 5000 6000.